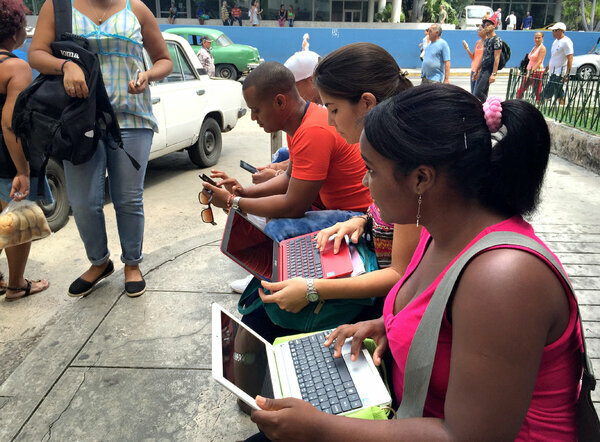 The best place to see Cuba&apos;s Internet explosion is along the busy Havana thoroughfare known as La Rampa, or the Ramp. Named for its sloping descent toward the sea, it is congested and loud. Still, crowds pack the sidewalks, office alcoves and driveways here to log on. 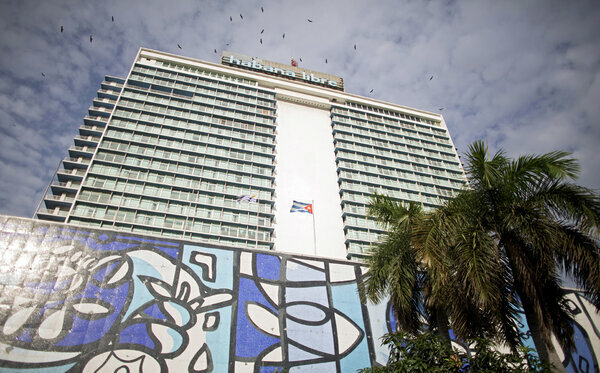 They huddle within a few blocks of huge cell towers atop the Havana Libre luxury hotel. All eyes are glued to smartphones, tablets and laptops. Raul Cuba, 41, types a lengthy Internet access code and password into his phone. He only learned how to log on a month ago. "I&apos;d never been on Facebook before and the first time I did, I got so excited. I started chatting with my family in Miami, in Italy and Spain," he says. Until this summer, Internet access only was available to tourists and officials, but since then the Castro government has set up dozens of pay-as-you-go public Wi-Fi hotspots around the country. And last month, President Obama allowed U.S. companies to invest in the island&apos;s telecommunication industry. But Cuba&apos;s public Wi-Fi remains out of most people&apos;s reach. 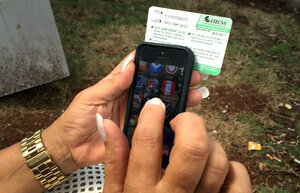 An access card sold by the state phone company, ETECSA, costs about $2 for an hour of Internet use, while the average state salary in Cuba is about $20 a month. The lucky ones have relatives abroad sending money and devices back home — or they work in Cuba&apos;s tourist industry, earning tips in dollars. Out on the Ramp, you can buy one of the Internet access cards for about $3 on Cuba&apos;s ubiquitous black market — more expensive, but it comes with technical assistance courtesy of Manuel Garcias, who&apos;s got a stack of cards for sale. Asked where he gets the cards, he says, "they come here and sell them to me — the husband or cousin of someone who works at ETECSA." So far, only about 5 percent of Cubans can get online — one of the lowest Internet penetration rates in the world. And you don&apos;t have to go far to see those left off Cuba&apos;s Internet highway. Just a few blocks down the Rampa, where the street dead-ends at Havana&apos;s picturesque Malecon seawall, is old-school Cuba — the original nighttime gathering spot for roving musicians, necking couples and revelers of all ages. There&apos;s barely a cell phone or laptop in sight. Franc Bernal Gonzalez, 17, and some friends have the night off from their mandatory military service. Only two of them have cell phones — old, little ones, where the only thing they do is make a call. "In Cuba, we didn&apos;t used to see so many people with all this stuff and the rest of us with nothing," Bernal says. "These differences started showing up a few years back, but have really grown bigger lately." The government says it will boost the country&apos;s extremely low Internet access rate to 50 percent in the next five years, finances permitting — but hardline politics may cut into that goal. The No. 2 official in Cuba&apos;s Communist Party recently accused outsiders of taking advantage of greater Internet freedom to "penetrate us and do ideological work for a new conquest." Back on La Rampa, there&apos;s no evidence of political penetration or subversive web surfing. Nearly everyone here is video-chatting with relatives abroad. "My love! How are you, my love!" exclaims Mari Jimenez, 53, reaching her son, who&apos;s driving in Miami. Jimenez just learned a month ago how to use her new iPhone 5, sent by her son. She has long, acrylic white nails — except on her index finger. "It&apos;s much faster to use the phone without the nail," she says. "I don&apos;t want to waste time or money." She&apos;ll just glue it back on when she gets home. Meanwhile, 18-year-old Daniella Hidalgo is checking out makeup tips from a YouTube beauty guru named Yuya in Mexico City. Unfortunately, the signal isn&apos;t that good and she only gets to see a few of the tips before the video cuts out. I ask Hidalgo if she visits news sites or anything political. No way, she says: "I&apos;m paying for this, I&apos;m not going to waste my money on politics." Jorge Bativia&apos;s been trying unsuccessfully for the past hour to video-chat with his girlfriend in Australia — whom he first met via an online chat — and is ready to give up. Even so, he says, he&apos;s glad the Internet finally came to Cuba. "Even if [the government] wanted to take it back, they can&apos;t," he says. "You can&apos;t keep people&apos;s eyes covered forever."